Destiny 2: The Revelry – Live Now! Visit Eva Levante in the Tower to begin the celebration! Verdant Forest: The Revelry grants you access to the Verdant Forest. It may conjure up memories of the Haunted Forest from Festival of the Lost, but you’ll find it in bloom to fit the season—and in combat, you’ll discover new twists to fight through. The objective is to clear as many rooms as possible. The more spaces you clear, the more time you’ll have to defeat the onslaught of five different bosses and claim your reward. If you want to fight with a team, you can bring one with you or let us matchmake one for you. If you want to go it alone, it will be dangerous, but that choice is available to you as well. Abilities and Orbs: The Revelry is a chance for every Guardian to break the rules about how Light is wielded as a weapon. When you first visit the Tower, Eva Levante will grant you a Reveler’s Tonic. Fill your tonic with Reveler’s Essence by killing bosses in the Verdant Forest or completing other activities. Three different tonics will reduce the cooldown of your grenades, melee, or class ability. Choose which buff you prefer and let the sparks fly. The more pieces of Inaugural Revelry or Vernal Growth armor you equip, the more potent the tonic will be. The powerful effect applies to every activity in the game except Private Matches. Revelers will even be more dangerous in the Crucible. The Reveler’s Tonic is not the only way you’ll increase your output of space magic during this event. Everywhere in the game, Orbs have the chance of being generated by precision kills. The best place to create tons of Orbs will be in the Verdant Forest, as that’s where they’ll drop most often. Double Drops: Similar to other recent events, Bright Engram drops will be doubled. Players at max level (depending on what content they have access to) will receive both a Bright Engram and a Revelry Engram every time they level up. There will also be a “knock-out” list for the Revelry Engram, preventing you from receiving duplicates until you’ve earned all the new items. Vernal Growth armor and Exclusive Items will be available in direct-purchase bundles. Bungie Rewards: Bungie Rewards is offering an emblem for eliminating 150 enemies with Super abilities during the Revelry. After you’re done dealing out space magic, claim the Super Celebratory Triumph, and then go to the Bungie Rewards Page to claim your reward! After completing an introductory milestone offered by Eva Levante, players will be granted access to explore the Verdant Forest. Players who explore the Verdant Forest will earn Reveler’s Essences, which can be turned in to Eva Levante for event rewards. Reveler’s Essences can also be earned by completing activities around the solar system. For information on specific Revelry rewards, players should visit Eva Levante in the Tower Bazaar. Additionally, The Revelry features new triumphs. These triumphs can be found by opening the character menu, tabbing left to Triumphs, selecting Events, then finally selecting The Revelry 2019. Complete all Revelry 2019 Triumphs. During the Revelry 2019, defeat three bosses in one run of the Verdant Forest. Complete any seven Revelry 2019 Triumphs. During the Revelry 2019, defeat bosses in the Verdant Forest while wearing at least four pieces of the Inaugural Revelry armor set. Clear simulation branches in the Verdant Forest. During the Revelry 2019, defeat enemies using Super abilities in any activities. During the Revelry 2019, generate Orbs of Light in the Crucible or Gambit while affected by Revelric Light. 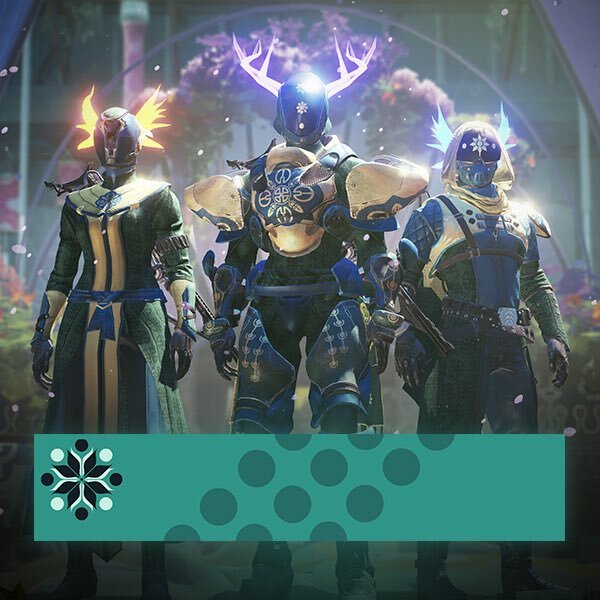 During the Revelry 2019, land grenade final blows in the Crucible, Gambit, or strikes. During the Revelry 2019, generate Orbs of Light in strikes or raids while affected by Revelric Light. During the Revelry 2019, land melee final blows on enemies in the Verdant Forest, any Black Armory forge, or in raids. During the Revelry 2019, generate Orbs of Light in the Verdant Forest or in any Black Armory forge while affected by Revelric Light. Complete daily and weekly bounties for Eva Levante during the Revelry. Players have until the end of The Revelry to complete these triumphs. Once The Revelry concludes they will no longer be eligible for progress, and incomplete triumphs will be hidden. Once players have completed the introductory milestone available from Eva Levante, they will be granted access to the Verdant Forest. The Verdant Forest takes place in the Infinite Forest on Mercury, however Destiny 2: Curse of Osiris is not required to access this activity. This standard version of the Verdant Forest features matchmaking, and will find players until a Fireteam of three has been assembled. In this version of the Verdant Forest, matchmaking is disabled. Players may enter the Verdant Forest solo, or with a pre-made Fireteam, but no additional team members will be matchmade into this activity. Once players enter the Verdant Forest, they will have limited time to progress through its floors. Players can extend their timer in the Verdant Forest by defeating enemies, and tougher enemies provide a greater time bonus. Once players run out of time, they will be teleported to the boss arena. There, players will have limited time to defeat as many bosses as possible, up to a total of five. Defeating more bosses in this phase grants players greater rewards. During The Revelry, players will have the opportunity to modify their gameplay experience by enhancing their ability recharge rates. For more information, please see below. During The Revelry, players will receive the Reveler’s Tonic pursuit item from Eva Levante. This pursuit item can modify players’ ability recharge rates across all activities in Destiny 2, for one hour at a time. Players can activate the Reveler’s Tonic for 50 Reveler’s Essences, which can be earned in the Verdant Forest or by completing activities around the solar system. Players can only select one of the above gameplay buffs at a time using the Reveler’s Tonic. The effect of these ability boosts becomes enhanced when players equip one or more pieces from the Inaugural Revelry or Vernal Growth armor sets, which are only available during The Revelry. In addition to Reveler’s Tonic, all players will have a chance to generate Orbs of Light for precision kills, across all activities in Destiny 2. Orbs are more likely to be generated for precision kills in the Verdant Forest. This will be active for all players in Destiny 2 at all times during The Revelry. In addition to Revelry rewards from Eva Levante and Revelry 2019 triumphs, players will earn a Jubilant Engram every time they fill their XP bar after achieving the max character level. This engram will be earned in addition to the Notorious Engram, awarding players double Bright engrams for the duration of The Revelry. For information on Jubilant Engram drop rates once The Revelry is live, players should visit our Destiny 2 Eververse Item Drop Chances support article. For information on Jubilant Engrams and other Eververse bundles, players should visit Tess Everis in the Tower Courtyard in Destiny 2. Players should ensure that all triumphs which are earned during The Revelry are claimed before this event ends. Unearned and unclaimed triumphs will be removed when The Revelry concludes at the weekly reset on May 7, 2019. Reveler’s Essences can be earned in the Verdant Forest, or by completing activities around the solar system. Ownership of Destiny 2: Curse of Osiris is not required to access the Verdant Forest. Players may only choose one buff at a time from the Reveler’s Tonic. Activating a new buff will overwrite any other buff that is already applied by the Reveler’s Tonic. During The Revelry, the Revelric Light buff grants all players a chance to generate Orbs of Light on precision kills and does not require weapons to be masterworked. We’re investigating an issue where the Virescent Emblem doesn’t track the deepest branch reached during a single run of the Verdant Forest. We’re investigating issues where Eva Levante doesn’t appear for players in the Tower. Players who don’t see Eva in the Tower may need to go to Orbit and then back to the Tower to find her and begin The Revelry. Players may want to try launching in the Annex area instead of the Courtyard. 50 Reveler’s Essence is required to open the Verdant Forest. Players must use the 50 Reveler’s Essence by inspecting the Reveler’s Tonic and choosing one of the three Good Moods. For Orbs of Lights not counting towards the Verdant Light triumphs, players must get precision kills that generate Orbs to count toward the triumphs.